Every great romantic vacation needs a great place to stay! 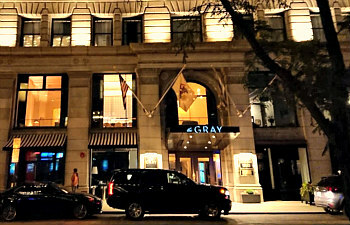 So with our directory of romantic places to stay in hotel rooms, inns and B&B's, we review and rate both luxury and affordable hotels, as well as small inns and B&B's all across the USA and Canada. Popularity with Couples & Honeymooners: based on variety of social media & crowd-sourced reviews. 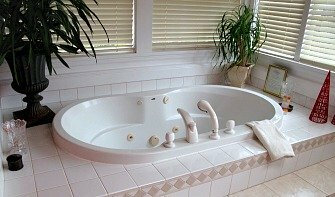 Unique Hotels, Rooms & Suites in the U.S.
Guide to Hotel Plunge Pool Suites - you may have seen them in the Caribbean, but we've compiled a selection of rooms with private pools right here in the USA, in states like Pennsylvania, Florida, Texas and California. 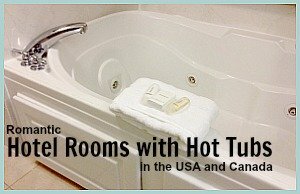 Romantic Hotel Showers for Two- we've carefully put together a new guide to hotel rooms across the U.S that have walk-in showers for two people. It includes affordable hotels and small inns, all with showers large enough for 2. 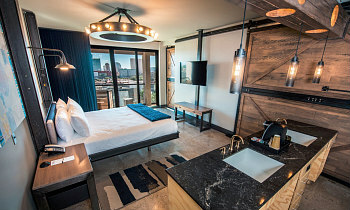 Ohio Hotel Rooms With a View - check out our selection of romantic hotels in Cincinnati, Cleveland, Columbus and other destinations in Ohio, all with city and Great Lake views right from your room or suite. 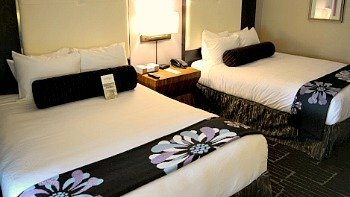 Romantic Theme Rooms in Hotels Across the USA and Canada - a fun look at theme suites and rooms in hotels, motels, B&B's and inns in over 20 states and 3 Canadian provinces. Everything from Arabian and Jungle rooms to more subtly themed inns with historical or classical decor. 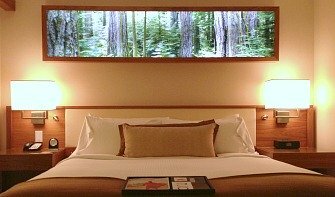 Hotels Near Waterfalls in the U.S. - just released for 2017, our comprehensive listing of some of the most romantic hotels, inns and B&B's with a waterfall close by. Feel the spray and have an incredible getaway! 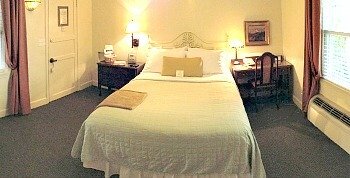 10 Unique Romantic Hotels in the U.S. and Canada - here we showcase 10 different romantic inns and small hotels that each offer an unusual but still romantic experience once you check in. Includes a paddle wheeler hotel in California, an epicurean experience at a Michigan B&B, and a library-themed luxury hotel in New York City. 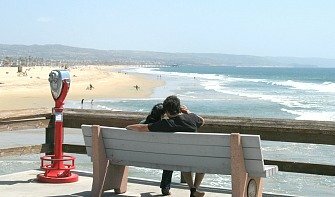 Beachfront Hotels & Inns in California - brand new guide featuring romantic resorts, hotels and small inns located right on the California coastline, including waterfront hotels in San Diego, Orange County, Venice Beach, Santa Monica, Monterey, and Mendocino, CA. Cheap Romantic Getaways for the Weekend - we've searched out affordable and romantic hotels and destinations that are ideal for a quick 2-night weekend getaway - see the results here. 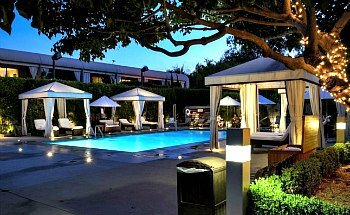 Romantic 3, 4 & 5 Night Mini Vacations - ideas and options for short vacation stays in hotels, resorts and more. 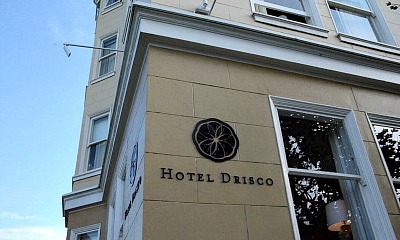 Hotel Drisco - What Other Couples Said: "Wish I Could Give it 6 Stars"..."Beautiful Hotel in a Wonderful Neighborhood"..."Wine & Cheese Evenings, Heated bathroom Floors". 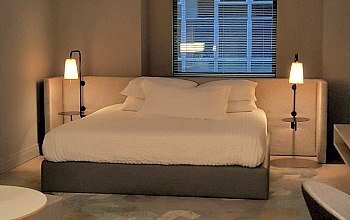 2017 Rating* for Romantic San Francisco Hotels: 96% of Couples Rate it Excellent/Very Good (2901 Pacific Avenue, San Francisco, CA 800-634-7277). 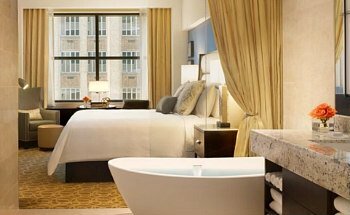 Romantic Houston Hotels - boutique hotels in Houston plus an inexpensive all-suites inn closer to the Gulf Coast. 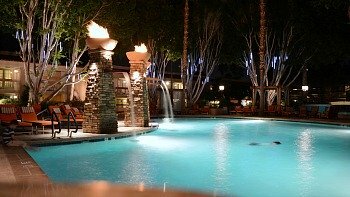 Scottsdale Romantic Hotels & Resorts - our pick of the top 5 most romantic resorts and hotels in attractive Scottsdale, AZ. 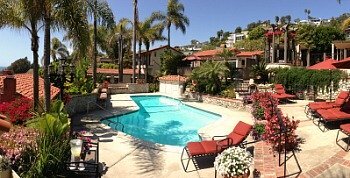 See More Photos & Video of this Romantic Southern California Inn here. 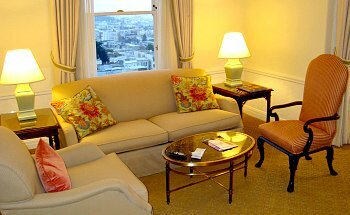 San Francisco Hotels - Find a great place to stay in the City by the Bay, quite possibly the romance capital of the USA. 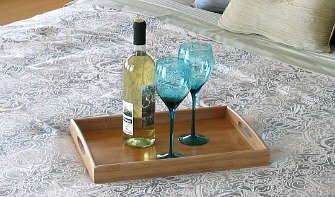 Northern California Bed and Breakfast Lodging - Romantic Wine Country Inns, plus some great B&B's for couples along the rugged and remote Northern California coast. 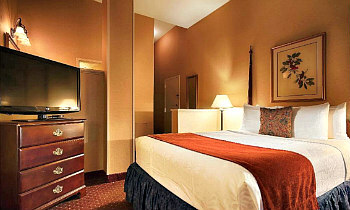 Lake Tahoe - We highlight a lodge, a resort and a small inn, plus some Lake Tahoe packages and honeymoon rooms. Hilton Grand Vacations Suites on International Drive - Even driving up to this huge Orlando resort after dark is romantic and impressive, all lit up with twinkling white lights surrounding the palm trees. Reminiscent of Tuscany in its design and decor, this Hilton consists of several buildings surrounding a lake and pool area, with a scenic walking paths winding around the edge. 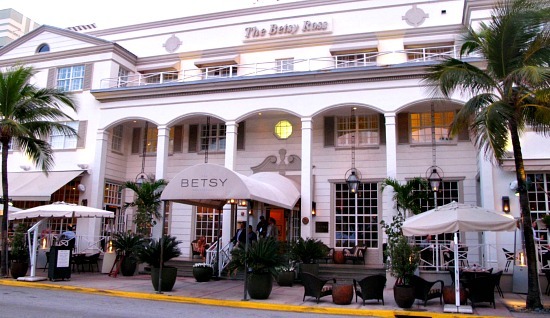 Romantic Miami Hotels - Romantic & trendy art deco hotels like the Betsy and the Beacon, plus a South Florida honeymoon resort on a private island! 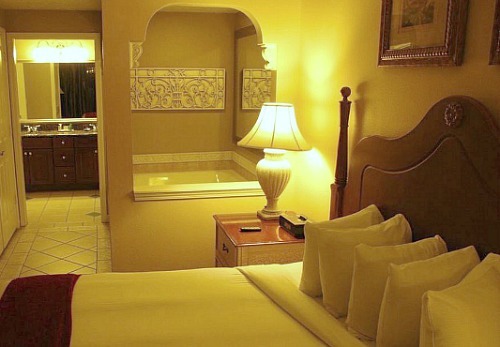 Key West Romantic Hotels & Resorts - Photos & Reviews of 6 of the most romantic places to stay for your romantic vacation in Key West, FL. 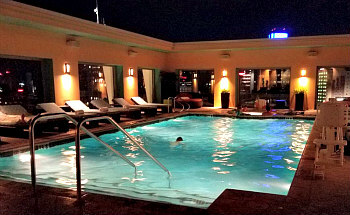 Atlanta Hotels - Includes a feature review of the Wingate by Wyndham Atlanta Buckhead hotel, plus listings of more romantic rooms in Atlanta, GA.
Savannah Hotels & Inns - Our look at places to stay for couples in gorgeous Savannah, GA, including the romantic Hyatt Andaz Savannah boutique hotel. Kauai Hotels & Resorts - Check out a couple of Kauai's top resort hotels for couples, as well as a small bed and breakfast with great hosts. Las Vegas Romantic Hotels & Resorts - Our look at which resorts on the Strip are best suited for getaways for 2. Cannery Pier Hotel, Astoria, OR - such a cool idea, converting an old cannery into a boutique hotel! The Cannery Pier really does it well, with terrific rooms outfitted with luxury tubs, hardwood floors, fireplaces and balconies that put you right out over the Columbia River. French Quarter Inn, Charleston, SC - you can't imagine a better inn in a better location, and in a better small city than this. 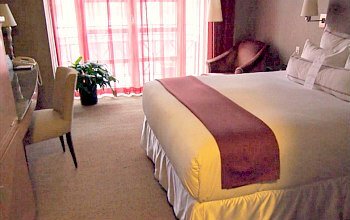 Charming and luxurious, the French Quarter Inn is just steps away from a compact display of the best that Southern U.S. culture has to offer. Everyone from valet to front desk to housekeeping was friendly and helpful, and in addition to their terrific breakfasts, there's wine and appetizers every evening at 5 and fresh baked cookies at 8. 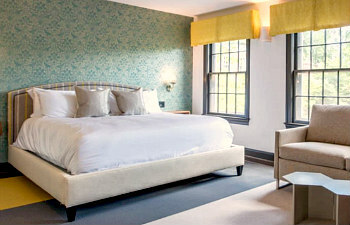 A review of romantic places to stay in Charleston, SC, including honeymoon suites and the fabulous French Quarter Inn. 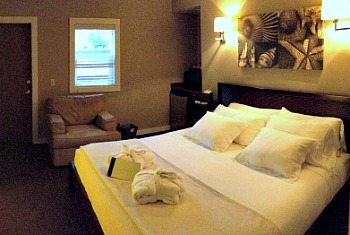 Texas Hill Country B&B's - the best and most romantic Fredericksburg and New Braunfels TX inns. 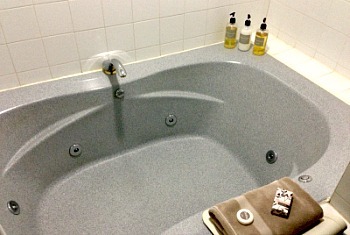 Whirlpool Tub for Two in the San Juans! Perfect places to stay for your honeymoon or weekend in Southern Alberta. Reviews and Photos of 7 Romantic Boutique Hotels and Inns for an unforgettable getaway in Quebec City. Fairmont Pacific Rim, Vancouver, BC - time to go big city here. Everyone knows Fairmonts are nice hotels, but the brand new Pacific Rim is really something else. First of all, this is hands-down the best smelling hotel we've ever been in (a delightfully subtle Jasmine fragrance present throughout the entire building). The rooms are not only romantic and luxurious, but high-tech. We're talking iPad controlled temperature and lighting, and a purely magical bathroom mirror with TV! The downstairs lobby is built around a beautiful piano bar, and just down the street are scenic water views and the cruise ship terminal in downtown Vancouver. Wickaninnish Inn, Vancouver Island, BC - we've never stayed in any lodge or hotel that takes better advantage of it's natural surroundings than the Wickaninnish. You can stargaze the incredibly dark night skies from your balcony, do some serious beach combing only 200 ft from the lobby, and at their Point restaurant, dine to the sounds of the outside waves re-broadcast softly on inside speakers. The rooms and service? Awesome. The "Wick" is not cheap and getting there takes some effort, but it's an incredible experience for any honeymoon, special vacation or anniversary getaway. 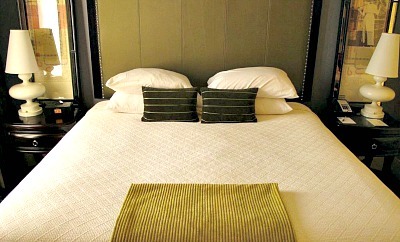 One of Canada's most romantic cities has terrific accommodation for couples in grand hotels and waterfront inns.